As I mentioned before, Codex Chaos Space Marines 2002 is much more logical and looks better fluff-wise than current Codex Chaos Space Marines 2007. And now another thing I like more in older Codex - Daemon Weapons. I'll quote small block of description of Daemon Weapons in both Codexes to show you what I mean. Adds an extra D6 Attacks in close combat. Roll the dice every time the model is about to attack. If the result is 1, the bound Daemon within the weapon rebels - the model may not make any attacks in this round and suffers one wound with no armour saves allowed. In version 2007 it looks like Daemon does not want to fight, does not want to spill the blood. It's strange behavior for the Chaos Daemon, don't you think so? While in 2002 version everything looks fine, Daemon gains his strength from butchering and drinking the blood. I want to suggest to create some home rule that will improve fluff part of Daemon weapons for Codex 2007. While it is easier to pass Leadership test than get 1 on D6 I will not suggest to use 2002 version right away. There must be better options. My first suggestion is to make 1 on Daemon weapon rolls work as +1 Attack, but to pass Leadership test at the end of the turn, but modify Leadership of wielder by -1 per each wound Daemon weapon inflicted. As a result Khornate Lord after inflicting 7 wounds will have to pass Leadership test against Ld 3. What do you think about it? I like desktop UI development. Especially I like architecture of Swing, but not so long ago I felt the power of Qt, thanx to Qt Jambi. Now I know that while Qt have some architecture problems it has superior Graphics, more usable widgets, and saves a lot of time on borders and pixels manipulations thanx to it's advanced widgets. But Nokia decided to stop supporting Qt Jambi, and gave it away to "community". While there are some smart guys on Qt Jambi mailing lists - it is not community yet. And of course I thought about ways to help Jambi survive. The problem is, I am Java developer, and Jambi was created for Java developers. Most of people on Jambi mailing list are Java developers. It is not very popular among C++ developers because they will not be able to use the result of their work. While Jambi generator is written in C++, and to be able to update Jambi according to Qt changes you should know C++. It takes rather long time to prepare and assemble full model, especially when you try to make it good one. When some interesting idea comes into your mind it takes you few minutes to clean legs, minute to glue it onto base, minute to glue body, minute to search for hands/head/shoulders, another 5 minutes to clean those parts, and another minute to clean glued body. So about 15 already wasted, your awesome idea had a good chance to flee away. Finally I found solution that works for me. I am preparing the most usable parts long before idea comes. 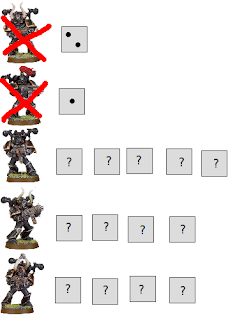 Chaos Space Marines have 4 types of legs and 8 or 9 types of bodies. It is possible to prepare 12 legs, glue 12 bodies and put everything on the shelf. Now you can start modeling almost instantly, and it saves a lot of fun because boring process of cleaning legs and putting body together does not distracts you from the main idea. I don't like current Codex Chaos Space Marines, for many-many reasons. One of them - there are too many places where I can't see any logic. Because of this I bought older Codex, written by Andy Chambers, Graham McNeill and others. And that Codex is totally awesome! It's a bit old to play with it though, but there are many things I like. Marks of the Dark Gods for example. In current Codex, released in 2007, Marks can be used everywhere and by everyone. And as for me it's breaking fluff by all means possible. For example, you can summon pack of Daemonettes without scatter on Mark of Khorne, or put your Sorcerer with Mark of Tzeench with 9 Berzerkers into Land Raider. How powerful and cruel Chaos Lord can allow this to happen? How is it possible when Dark Gods are watching you? 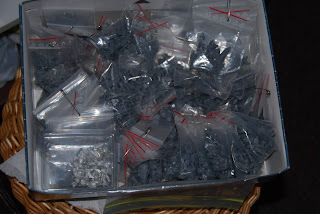 I don't know, but it seems to me that Codex' author wanted to play Orks too much, so he made ones, using Chaos kits. But let's return to how Mark works. Summoned Daemons and Terminators can arrive on Mark without scattering, and also Mark somehow is visible from the transport vehicles, and adds some abilities to their bearers. That's it. No more restrictions, no more options, no more advantages. In this older Codex everything looks logical and close to perfect, almost like it really would be in Eye of Terror. Do you know that Khorne and Slaanesh are mortal enemies, like Tzeench and Nurgle? So, if your army's leader have Mark of one of four Gods - your army cannot contain any units, dedicated to God's mortal enemy. Of course it can't, just because your leader will kill all those bastards in the name of His favored God! Next feature, Daemons can be summoned only onto Mark of their God or onto Chaos Undivided Mark. In Codex 2007 I always wondered why my Daemonettes would not attack unit of Berzerkers with Icon that summoned them, or why should they come at all? In Codex 2002 everything is just fine, like it should really be. Codex 2002 is a bit outdated, and as for me can be fairly used only in combination with Rulebook 4 and older enemy Codexes. It's navigation is not that simple, it's unit costs does not make any sense against Codex Space Marines 2008 or Space Wolves 2009, so heavy refresh is required before making it playable. But it's so awesome when comparing against current Codex Chaos Space Marines, with so many interesting features, and real feeling that it's Chaos Legions, cruel and glorious warriors of the Dark Gods, while current Codex 2007 makes it feel like you're playing some Chaos Orks or something. So I will better wait for Codex Blood Angels and will use it for my Night Lords army until next Chaos Codex will be released. 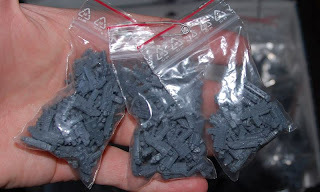 It will represent Night Lords Legion a way better than Codex Chaos Space Orks Marines. When you'll try to compare Codexes of Space Marines and Chaos Space Marines you will notice that their weapons list is different. But why is it so? They're almost similar armies. Here is the knowledge of different weapon types I know/heard/read about. Assault Cannon is powerful Space Marines, and Chaos have nothing similar. First I thought that it was created after Heresy, and Chaos Marines can't be equipped with those weapons because of this. But then one of Horus Heresy novels about Dark Angels mentioned Assault Cannon on Dreadnought. It is said that Assault Cannon is not stable weapon and jams from time to time. And in 10.000 years Chaos Marines lost all of their Assault Cannons, using more stable older pattern Autocannons instead. Autocannon exists in both Codexes, but it looks like only Predators and Dreadnoughts can use it. So, if weapon mentioned in both Codexes - it's obviously pre-heresy weapon. 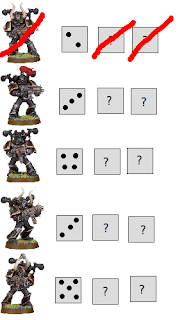 But then Chaos have Autocannon pattern for troops. Looks like this pattern was implemented just before Heresy, and Horus ordered to supply his legions first, then Mars was salvaged and loyal Marines got nothing. It's twice as effective as simple bolter, and Loyal Marines have it. It's obvious that it's pattern was found after Heresy, because otherwise Horus' elite terminators would be equipped with those things. 1. All Chaos Plasma cannons got hot, and Dark Mechanicus don't want to build more of them. Well, it doesn't looks like true, because Plasma guns are still used in Chaos forces, and effectiveness of weapon worth the risks of using it. 2. Troop option appeared after Heresy, the same as Autocannon but from the other side. Still, I am not sure, if you know something or have some ideas - comment please. This article is about Wounds Allocation in Warhammer 40.000. Inspired by BoLS article on the same topic and contains some my ideas and suggestions on how to improve current wound allocation rules. Previous edition of Warhammer 40.000 rulebook used different wound allocation strategy. 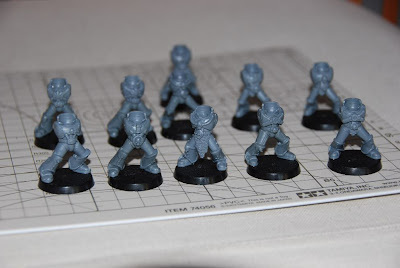 For instance, we have Chaos Space Marines squad of 5, without any special features. a) We got 3 wounds. Nothing special here, we will just take 3 saves and will remove those who failed. b) We got 5 wounds, and our opponent can choose who will take individual save. But all models are the same, so no need to choose between them. Each model will take exactly 1 save, so we have 0.33 chance to lose all our models. c) We got 15 wounds. Book states that we will roll all the saves at the same time. And statistically 15 * 0.33 = 5 and all models will be lost. But it looks like the story of Schrödinger's cat, statistics can only show us probability and all 5 models somewhere between life and death. How will it look like if we have only 1 dice? 0. Each model have to roll 3 saves, so it still can be saved. 1. First roll - 2. First model is dead. 2. Second roll - 1. Second model is dead. 3. And NOW they all will surely die, becase 3 models will roll other 13 dices. 5th edition came with new wounds allocation system, that from the one hand can help you to save few more units and from the other hand - risk to loose special model is higher. For example, we have Chaos Space Marines squad of 5, with Aspiring Champion and Meltagun. a) We got 3 wounds. We will allocate them on simple models, so Champion and Meltagun will surely live. b) We got 5 wounds. Now we must allocate them on all models, and Champion and Meltagun will take their own saves, while other 3 wounds will go to simple models. In this case chance to lose Champion or Meltagun is much higher than in 4th edition, where opponent was able to choose only one of them to pass it's own save. c) We got 15 wounds. Now we will allocate 3 wounds on each model. 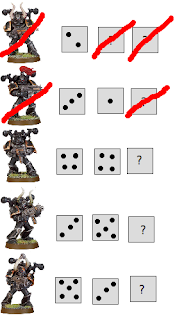 Statistically all the squad will die, but being Warhammer 40.000 player will you just remove all the squad without rolling dices? Dice does matter. We will roll for the Champion, then for Meltagun, and then - gues what - we will roll other 9 dices for 3 models similar to 4th edition! Why is it so? It's only half solution of 4th edition, it's not complete working system. The first solution that comes in mind - let's roll separately for each model. Statistically it will lead us to the same result, but it will save us from problems of 4th edition. We will just roll 3 dices for each model, and that's it, some of them will get their chance to live another minute. Well, we have working solution, now let's think about how to save some time. 3. Roll last line of wounds as normal, now each model have it's last roll, without taking rolls for their long-dead brothers. In my examples it's obvious that we just saved 3 of our Marines from another line of 3 wounds, minimizing chance to lose them by 0.33. Maybe you have better suggestions? It would be great to improve current systems, to make them closer to perfect.